or a writer, it’s exciting to hatch a new idea. Maybe you even have a rockstar logline. But it’s all too easy to take that idea and run, only to stumble at page 30 without a clue of where to go. Don’t worry – this is avoidable. You just need a firm grasp on how to map out your idea. With the right tools, you can see if your idea has the “legs” to deliver a feature-length film to the finish line. How do you do that? In today’s post, we’ll examine how, with Blake Snyder’s famous “Save the Cat” beat sheet template that revolutionized the industry. Get ready to chart out your idea over 15 unique beats to see if it holds up! Download your FREE film beat sheet template. In film development terms, a “beat” refers to a single story event which transforms the character and story at a critical juncture. Think of beats as “checkpoints” along the way, that will complete the story and chart out a film structure. In his book “Save the Cat,” screenwriter Blake Snyder boiled film plot structure down to fifteen beats. He also includes the suggested page number each beat should should occur on. We included those on our Save the Cat beat sheet template. You can even use a beat sheet calculator if you know your expected page count. This also comes in handy if you want to write a short film beat sheet. Story and character are two halves of the same coin. Inevitably, your protagonist will attract characters and scenarios that will teach the valuable lesson of the story (i.e. the “arc”). It's crucial to give your character a strong and clear need. After all, their desire will dictate the story of their lives, and drive them toward the irreversible change of your finale. We will use the great beat sheet example found in The Matrix to illustrate the effectiveness of Blake Snyder’s creation. Start strong with an image that catapults your audience into the look and feel of your story. Blake Snyder suggests knocking this out on your first page. 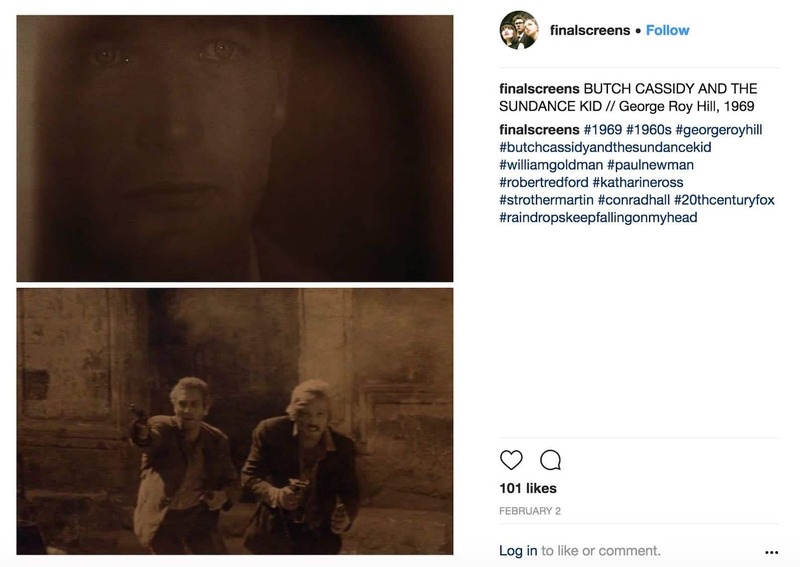 Look no further: Instagram account @Finalscreens shows how much story can be conveyed in the first and final images of a film. Film structure can be summarized in strong opening and final images. Let’s use the act breakdown of The Matrix to show the power of the Save the Cat beat sheet template at work. To start, The Matrix boasts a strong opening image: a blinking command line cursor. The film is about a hacker named Neo (Keanu Reeves) who realizes his life is a computer-simulated reality (The Matrix). Seeing this blinking cursor predicts “how deep into the rabbit hole” of technology Neo will go. Over the image we hear Trinity and Cypher, on the “other end” of the cursor. They’re liberated from The Matrix, and looking for their savior (Neo). Film structure requires that the theme of the film is communicated by someone fairly early on. Commonly, this is dialogue spoken to the protagonist that he doesn’t quite grasp yet. This very subtly suggests that Neo will learn to unplug from his computer simulated reality, and how to fight those who were keeping him there. Use your first ten pages wisely. Here, you’ll need to establish your story scope (and “look and feel”) for the audience. First, show your character in their “old world.” Let the audience know what the status quo is for them, then hint at the adventure that will follow. Second, establish all characters who will factor into your main story beats. This may take some creativity. Sometimes, for story reasons, you will just have to hint at those characters. The setup is one of the most important sections of your script because it provides the essential context needed for the audience to become either immediately engaged, or lose interest within the first ten minutes. Obviously as a screenwriter, the former is required to start and sustain a career. 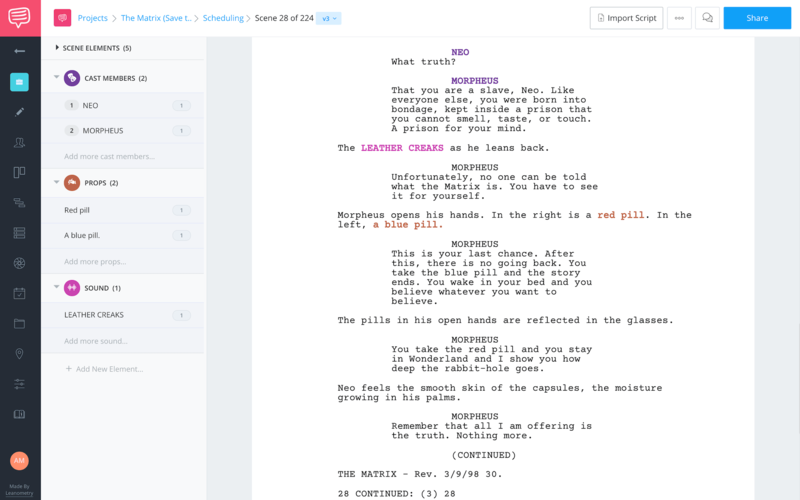 In StudioBinder, you can write your screenplay right in the software or upload it from a previous format. Below, we'll upload The Matrix and see how the following scene was setup. The Matrix begins with an action sequence cleverly to establish how there are people in Neo's world (Trinity, the Agents), who seem like they are from another place all together. They defy the laws of physics, and seem to come and go as they please. We also meet Neo, and learn that he senses this other world, but it’s just beyond his grasp. When you want your audience to get engaged quickly, it's these pieces of essential context that will make that happen. StudioBinder allows you to import famous screenplays to get examples for when you're ready to use the software to write your own. Sometimes called the “inciting incident,” the catalyst is the event that disrupts your protagonist’s status quo. But they’re not ready to make the choice that catapults them into the story just yet. In The Matrix, this happens when Neo meets Trinity in a club. She tells him that he’s in danger. This inciting incident gets us hooked to the story, let's see what keeps us there. This is where the protagonist has doubts about setting out on their perilous journey. How does this beat manifest in The Matrix? After talking to Trinity, Neo finds himself hunted by sunglasses-wearing “suits” (the Agents). Thankfully, he’s on the phone with Morpheus - the leader of the rebellion Trinity represents. However, Neo’s not strong enough follow through on Morpheus’ orders to escape his office building. In Joseph Campbell's "The Hero's Journey," this is called the 'refusal of the call,' which can be explored further here. Inevitably, your protagonist will overcome his or her doubt and make a choice to set out on their adventure. This choice is what sets the plot in motion. From here on out, your Save the Cat beat sheet template will be filled with obstacles and twists resulting from making this choice. You guessed it: this is where Neo takes the Blue Pill (to unplug from The Matrix) over the red pill (to resume status quo). While you're writing, there's nothing wrong with planning ahead. 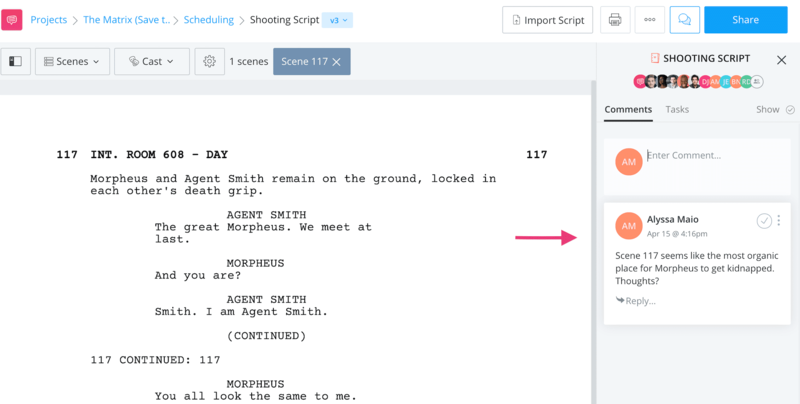 In StudioBinder, you can write your script, while simultaneously tagging important elements for shooting. Identifying key elements is helpful for planning, but when you're still writing your story, other less obvious elements come into play. Let's discuss what those look like. The A story revolves around the choice your protagonist made as Act 1 breaks into Act 2. But another subplot ensues, commonly a love story. Blake Snyder suggests this at around Page 30, and that it illustrates the theme of your film. The Matrix does not conform to this succinctly (remember, the Save the Cat beat sheet template only gives you suggested page counts). The B Story is the blossoming romance between Neo and Trinity. It starts when they meet in the club, and blossoms once Neo has left the Matrix and is aboard the Nebuchadnezzar with Morpheus and his crew. Trinity gives Neo strength to believe that he’s their savior (AKA “The One”). Your plot structure requires a stretch where your protagonist wields their new power, and does cool stuff with it. In The Matrix, Neo enters a virtual program (The Construct), where Morpheus teaches him all kinds of fun stuff. Here he starts to hone martial arts skills and how to jump really high. Have fun with these scenes. Just make sure they make the world you're creating more interesting or serve a purpose. At some point, your protagonist will either get what they’re after... or not. But there will be consequences either way. Neo takes the blue pill to see if he’s truly the humanity’s savior. But, at the midpoint, he goes to the clairvoyant Oracle to see if this is true. She gives him a once-over and, tragically, tells him it's not true. Before we finish off the steps of the Save the Cat beat sheet template, let’s go over some quick pointers on filling it out. First, know that you won’t hit the suggested page count perfectly. It’s there to guide your arc. If you know your page count will be longer than Blake Snyder’s set 110 pages, find a handy beat sheet calculator to recalibrate. Finally, keep the story circle in mind as you chart out each beat. Approach story and character as though they’re the same thing. If you get confused, write tandem beats where both character and plot are parallel, to better see why the beat needs to happen. After your protagonist gets what they want, or not, there will be consequences. These forces will tighten their grasp, and throw the protagonist off balance. These forces don’t necessarily have to be bad guys. It can also be fighting within the protagonist’s circle. Back to The Matrix. This is the section where Cypher betrays the team and allows the Agents to capture Morpheus. This thwarts the team’s relative control amongst chaos. In film structure, the dire circumstances your protagonist endures will lead to an inevitable loss. This is usually a character, and classically the “mentor” (think Obi-Wan, Gandalf and Morpheus). Whatever the loss, it’s felt deeply because this item (or person) gave the protagonist their bearings. In The Matrix, this is where Morpheus is kidnapped, and the location of Zion -- humanity’s last save haven -- is compromised. Executing decisions like these might be challenging, but definitely necessary to create the best script. If you're writing with a team, or a partner, it might be even harder. Not everyone will agree, so it's a must to stay on the same page, along the way. Waiting to hear back from your team days or weeks later only prolongs the shooting process. The software makes it easier to make changes quickly. 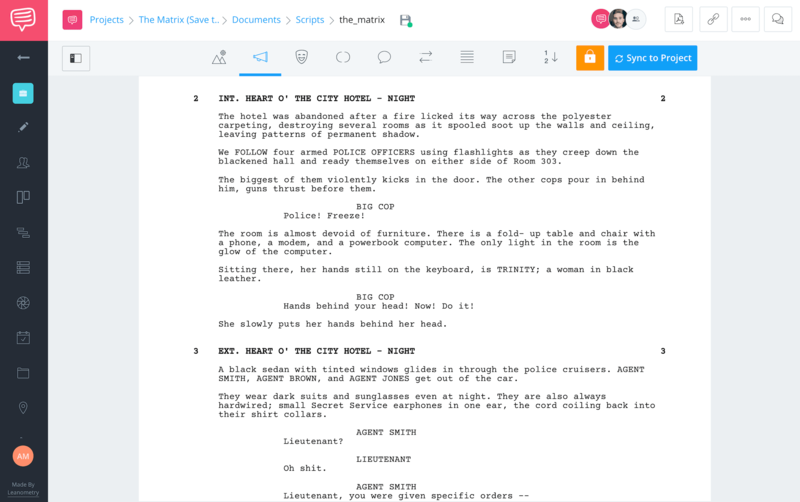 In StudioBinder you can make changes to the script in the document section, or add comments in real time to the shooting script. These few pages in your script, and the next ten will determine if you meet or exceed the expectations of your audience. Staying on the same page with your team is crucial at this stage, whether your in the development or even making last minute changes right before shoot day. This is the most dire circumstance your character reaches. At this point of the Save the Cat beat sheet template, your protagonist has lost hope. In The Matrix, this is where Neo and his team come to the tragic realization that they have to pull the plug on Morpheus. Otherwise, the Agents might thwart humanity forever. Like a forest fire, loss and misery are followed by new life. In plot structure, this is where your protagonist claws around in the darkness, only to find or remember something useful. In The Matrix, Neo is reminded of some crucial information he gleaned from the Oracle. This gives him the confidence to take arms and save Morpheus from The Agents against impossible odds. Trinity goes with him. Treat the finale as the Act 3 summary. The Save the Cat beat sheet template is at its end, so it’s time for the protagonist to take on their foes. Armed with new tools and self-discoveries, the protagonist often synthesizes what they've learned (in Act 2) with values they've always had (Act 1). In The Matrix, Neo and Trinity put their training to the ultimate test to take on the Agents and liberate Morpheus. Eventually, Neo has to face the lead Agent by himself. He channels a feeling he always had, even when inside The Matrix. He “unplugs” from the Oracle’s logic and follows these feelings, which give him godlike powers in The Matrix. He’s indeed The One, and subdues The Agents. Along with the opening image, the final image creates the bookend that encapsulates the journey. It’s the last thing the audience sees, and should cement the theme of the film, as well as represent what happened and changed over the course of this journey. The Matrix, closes on Neo. We hear his voiceover talk about the next steps of liberating these humans stuck in The Matrix. Then he takes flight! Being The One has endowed him with superhero qualities in The Matrix, which he will now put to use. It’s helpful to find a good beat sheet example before you get started on your Save the Cat beat sheet template. To find one, look no further than the Save the Cat website itself, which offers a trove of completed beat sheet templates from movies you know. Thumb through this list and find films with genres and structures that most closely mirror your own idea. Seeing how another film nailed their plot structure can get you thinking about your own in a different way. Also check out this completed beat sheet template PDF by John August, for his “Charlie’s Angels” screenplay. It employs a unique style which might be useful for your script. When you're wrapping up your script, there will come time for creating script sides for shoot day. "Script sides" are the pages of the script being shot the day in a production. Most movies (and T.V. shows) are not shot in a linear fashion, so these sides come in handy for the cast and crew to know what is being shot. Having your script sides ready inform attendance on the call sheet, and are helpful for auditions when the entire script is necessary for the actors. When your creating your sides, you won't necessarily need to share the entire script all at once. Take look below and see how you can use StudioBinder to create, manage, and share your sides with your team when it's most necessary. Developing your concept and taking it from script to screen has never been easier with StudioBinder's software. See below for more tips on writing. It’s crucial to think about film structure after you hatch a new idea. But you also want to avoid over-analyzing the structure too. The Save the Cat beat sheet template is only a guide. The suggested page count for each beat doesn’t have to be exact. Every script is different, and structure should serve the change that your character makes during the events of the story. Once you “break” your story into these fifteen beats, consider writing a film treatment to flesh it out further.